This is an ideal class for artists who paint with pastels and would like to expand their use of this versatile medium. It is also suitable for artists who are new to pastels and would like to explore painting with pastels. Each class will begin with an introductory lesson and allow for plenty of easel time with individual feedback. Instruction will include pastel techniques with hard and soft pastels, under paintings techniques and the principles of composition & color. Beginner & Intermediate. Before you buy pastels, the instructor will review the many types of hard and soft pastel in the first class. Bring whatever you own. No oil pastels. Instructor will sell sanded pastel papers by the sheet and review pastel surfaces to be used. ​Betsy Payne Cook paints exclusively with pastels, and is honored to be a juried artist member of the Pastel Society of America and to have achieved signature membership status of the Pastel Painters Society of Cape Cod (PPSCC). Betsy is acknowledged as a juried Master Artist at the Cape Cod Art Association. She participates in local and national juried exhibitions, and is a member of several art organizations. Betsy is represented by Gallery Artrio in Hyannis and True Grit Gallery in Middleboro. Betsy records her thoughts and experiences as an artist in her newsletter “Painting In and Out”. Her hope is to provide inspiration and insight while sharing her love of pastels and her life as an artist. Betsy teaches pastel workshops and classes, and is on the faculty of the Falmouth Arts Center and the Cultural Center of Cape Cod. Betsy organizes Cape Cod plein air classes and workshops including destination plein air painting workshops in Wales Great Britain. Betsy attended the College of St. Rose in her home town of Albany, N.Y, earning a B.S. Art Education & a M.S. Special Education. Cape Cod was always a family favorite for a week’s vacation, or a weekend; and she made it her home in 1994 when she returned to the states after living in a small village in Wales, Great Britain for nine years. 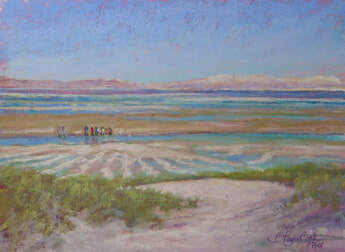 Betsy’s pastel paintings have been exhibited in many competitive local and national juried exhibitions. Her solo show “Traversing the Atlantic: Travels with my Pastels” featuring her plein air paintings has rotated through local venues in 2017 and 2018.